The R311 sits in position at UW-M Panther Arena. Dean Rosko, photo. DTOS is the proud sponsor of the organ at Miller Park. 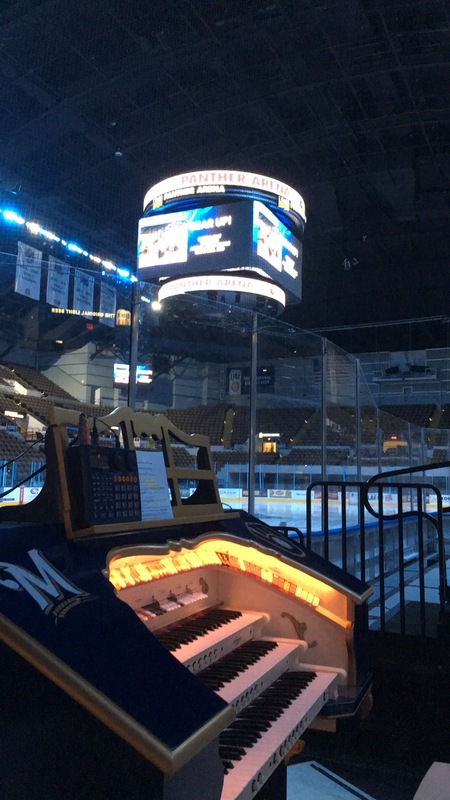 When the organ isn't entertaining crowds at a Brewer's game, it can be heard during Milwaukee Admirals hockey games! The console occupies a prominent position in full view of the fans, and lends an exciting element to the atmosphere at UW-M Panther Arena (formerly known as the MECCA Arena). Through a significant investment in the building itself, the Admirals have helped to bring the 60-year-old building into the 21st Century with new sound and lighting systems, concession stand and restroom improvements, as well as creating all of the infrastructure for hockey. Since the early 1980's, the Admirals have called the Bradley Center home, but upon construction of the new Milwaukee Bucks arena, the Admirals relocated back across the street. There is a wonderful air of nostalgia in this building, and the organ only adds to that! We look forward to many great things! When we received the organ, it was transported to the home and shop of Dean Rosko, where he and his father Rich worked to refinish it, and apply the appropriate logos. Painted “Brewer” blue, and trimmed in gold, the DTOS logo appears on both sides of the console, with the Milwaukee Brewers logos on the horseshoe lid. The Brewers are also great partners with the Milwaukee Admirals, so at least for now, the decision was made to not change the console decor for hockey. The DTOS Allen R311 had been the personal home instrument of longtime member Will Lorenz. We would like to offer our most heartfelt thanks to his daughters Linda Lorenz and Carol Lorenz-Gaetke. Through their generosity, DTOS will reach numbers of people never before thought possible. Whether we spark the interest of one person or a thousand, the gaining of both Miller Park and UW-M Panther Arena as “DTOS venues” is a massive feather in our cap, and we know Will is smiling!